Personal Defense Systems embraces all types of shooting sports. Throughout the year we will show our support by volunteering to host shooting clinics & several fundraisers and that enable people to get more involved in the shooting sports. We hope to see you at one of these unique events throughout the year. Once the details for any new clinics are finalized we will post them here so check back often. Ohio Shooting Sports, Ltd and Anderson Shooting have teamed up to offer a 1 day handgun clinic for those who shoot competition handgun sports IDPA and USPSA. This course will be taught by Steve Anderson and is entitled, "Efficiency & Accuracy". It is for designed for those experienced competitors who have an intense desire to move up the classification system and see their performance dramatically improve. 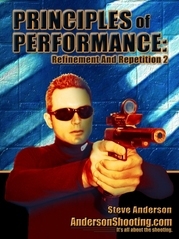 Steve is an experienced instructor who is also a seasoned shooter, Grand Master Class competitor and author of two books, "Refinement & Repetition" & "Principles of Performance", http://www.andersonshooting.com/ Each student who attends this course will have the opportunity to purchase Steve's books during the class at a reduced cost. In this clinic, the student will improve their craft through hands on training, techniques for self-analysis and learn methods of how to practice. This 8 hour intense shooting program will concentrate on developing a tailored practical maintenance program for each student and one-on-one analysis of the competitor’s strengths and weaknesses. Get immediate feedback on your game. Learn how to trim your time and yet stay within the rules of the game. You want to improve and win. Now there is a place to get the feedback you need. If you follow Steve's instructions you can expect to move up 2 classifications in 6 months.